One of the frustrating limitations in supporting secure websites has been the inability to share IP addresses among SSL websites. In the day, there were a few ways to solve this limitation. One, you could use multiple IP addresses, binding a SSL certificate to each combination of an IP address and standard SSL port. This has been the best method to date but it is administratively heavy and not necessarily a good use of valuable IP addresses. Another approach was to use additional non-standard ports for SSL. While this saved IP addresses, you would potentially run up against strict firewall or proxy limitations making this method undesirable. Finally, in the IIS 7 and 7.5 worlds you could use host-headers to share a certificate among websites but you were limited to a single certificate that each web site would have to share. The reason behind these limitations rest in the handshake that takes place between the browser and the web server. When a SSL client request is initiated, the HTTP header data is not available to the web server. Only after successful handshake are the headers encrypted and sent to the web server. Too late to allow for successful redirection to the desired web site. There are many resources on the Internet that deal with setting up and configuring a site using SSL bindings as well as utilizing SNI from within the IIS Manager. Where I’d like to focus the second part of this blog is in creating SNI web-bindings using PowerShell. As a driver for implementing SNI is the scalability it provides, this scalability might be for naught if not coupled with the ability to deploy a solution without the use of a GUI. The name specified would be the name of the web site you’d like to add the binding to. The protocol and port are standard for SSL bindings. The host header is the URL you’d like the web site to respond to. Finally, SslFlags with a value of 1 enables SNI for this binding. While I won’t cover the process to request a certificate or import the certificate into the local machine store, there are two factors we need to address before using the certificate in the third and final step. In order to use the certificate in IIS it is critical that the certificate is imported allowing the private key to be exported. 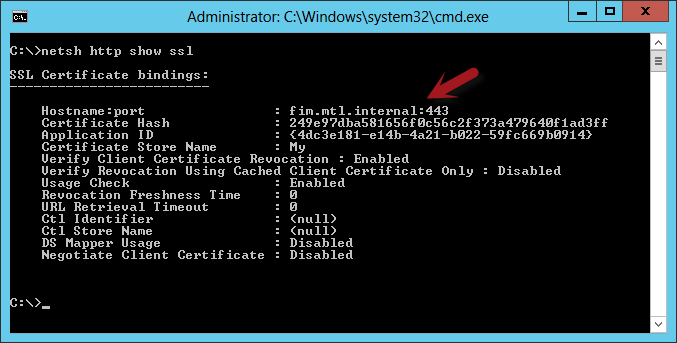 If a certificate is used without an exportable private key, IIS will be unable to bind that certificate. Creating the SSL association in the third step requires we have some reference to the certificate we’d like to associate with the web site. There are two values that can be used. The thumbprint of the certificate or a reference to the certificate object itself. In the above example the friendly name of the certificate is used as the matching context. One could also use the subject instead. After this step you will now either have a direct reference to the certificate or the value for the certificates thumbprint. The final step in the puzzle is tying together both the binding and the certificate. This can be the trickiest part to get right. PowerShell doesn’t provide a native cmdlet to directly do this. Instead, one needs to use the IIS drive exposed by the WebAdministration module to create a SslBinding object and associate that object with the certificate. In the above, notice the SSL binding is using the hostname:port syntax which confirms SNI is in use. 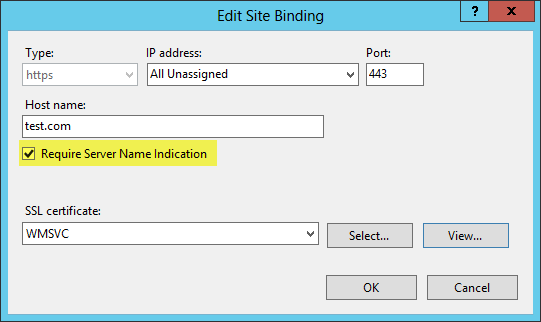 Following the above steps will allow you to take advantage of the new Server Name Indication (SNI) implementation in Windows Server 2012 and IIS 8. Any way to pass a $Port variable instead of hard coding the port number (443 in the article example)?